I have a powerful book to share with you. 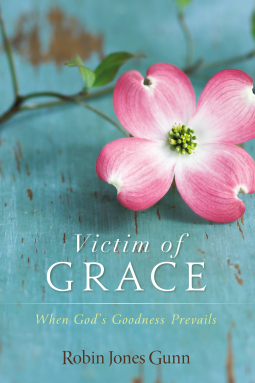 Victim of Grace by Robin Jones Gunn really makes you stop and think and begin to view God’s grace from a different perspective. Grace is defined to mean unmerited favor. Therefore, we are all victims of grace – completely at the mercy of God. Robin reminds the reader how God loves to display extravagance – in blessings, love and grace. Life can only be experienced to the fullest when we live within God’s grace. Each one of us need to trust and thank God even before our prayers are answered. Robin, through scriptures, reminds the reader that grace is also a protective covering and our source of strength. I love how Robin sues stories to exemplify the points she is making throughout the book. I would readily recommend this book. It is a wonderful way to get a new vantage point on grace.